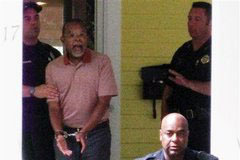 Question about Henry Louis Gates’ encounter last week with Cambridge’s finest: what’s up with the witnesses? The initial reports suggested there were half a dozen onlookers, but I haven’t heard anything further about this. It’s hard to believe that no one has managed to round up at least a couple of them since Thursday. Like, say, the neighbor who took this picture. Have I just missed something? Did I read the initial reports incorrectly? Or what?